I love butterflies and try to use them as much as I can in my projects. This was a fun card to create and I got to demonstrate how the Stamp-a-ma-jig works. I'm usually a stamp and go type of person but really can't with this card. The other thing about this card is I started doing Facebook parties in my business. If you can't have a party in your home, you can still have one but everyone just logs in to Facebook at a certain time and we party together live through a Facebook event. It's a lot of fun and I share exclusive products and videos and the hostess gets all the rewards of having a typical in home workshop! I shared this video to demonstrate how to make this card. Not the best quality and some background noise but enjoy my very first ever project video! 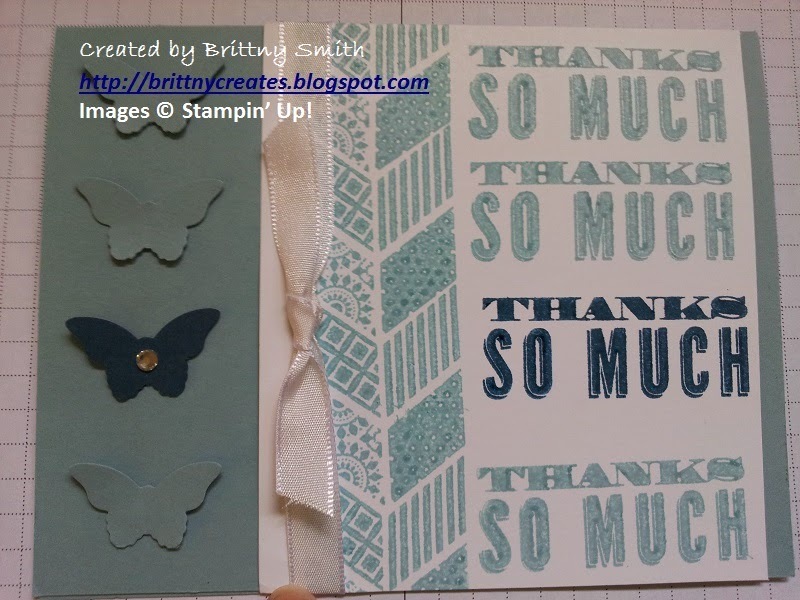 If you want to host a live Stampin' Up! Facebook party contact me at brittnycreates@gmail.com and we'll get started planning your event.